Gruen never fails to surprise.... just when you think all of the documents have been found and nothing new will surface that has any real significant value, something does. Not only had I nor my researcher friends never seen a copy of the 1927 Stock Record Book, none of us knew it even existed. No where is the book referenced. As soon as I received this rare documents, I began working on sharing it with the Gruen community. These 2 books are similar in format and contents. They are both "counter catalogs" that Gruen published so that their jewelry store partners could show the entire line of Gruen watches to their customers. They are the only books in which Gruen meticulously detailed every model that was available for purchase. Every Gruen Watch in the current line is illustrated in the Stock Record Book. Each model has a list number, an advertised retail price and a detailed description of the case and movement. Use the book as a reference for marking and checking you watch stock. This differs from the 1929 catalog in which Gruen suggested be used as a sales tool that customers can puruse. It's easy to see the improvements made from the 1927 book to the 1929 book that made the Guild Book much more customer friendly. 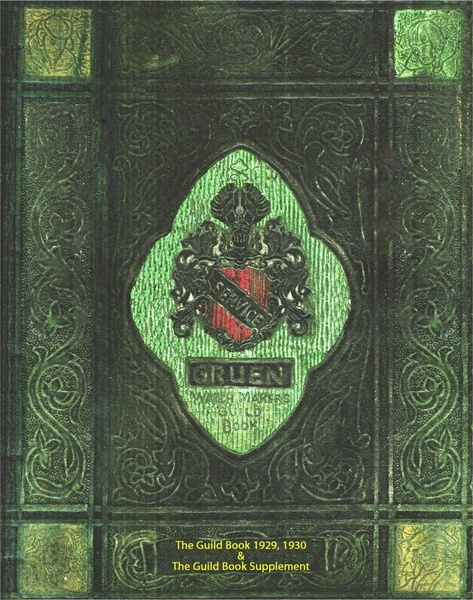 Every other page of the Guild book tells the Gruen story while the 1927 Stock Record Book has page after page of watches, with none of the filler text. The amount of information in these two books is immense. Together they describe over 1,700 Gruen Watch Models in detail! There are over 700 watches described in the Stock Record Book, many of them not in the 1929 Guild Book. The 1929 Guild book has 660 watches in the main part of the book. This means that the core offering of watches for 1927 and 1929 were roughly the same size, with some being removed and others added to create the 1929 book. Thus you are getting a document that is just as useful at identifying early Gruen watches as the Guild book. In fact, slightly better by some 40 watches. The difference in size of the books can be attributed to the Gruen Company story pages that are on every other page of the 1929 book. For researchers, this book is very special because it is the first and only time Gruen has provided a list of their entire offering of watches in a snapshot in time. Only those watches being sold in 1927 are in the book. No more, no less. To help navigate this large number of watches, I've created an Index which you can view at the bottom of the page, or download the PDF below. It was a huge undertaking to key in every watch described in these books, but one worth doing for sure as documents like these are so rare to encounter. 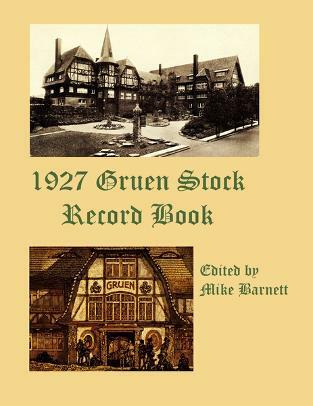 This 40 page PDF file is an Index for BOTH the 1927 Stock Record Book and the 1929 Guild Book. It will greatly help you navigate both of those books. It ties together The Gruen Watch Catalog with the 1927 and 1929 books. Once a watch is located in The Catalog, it is an easy lookup in this Index to find exactly where to go in order to get the full description of the watch. As previously mentioned, the 1929 Gruen Watch Makers Guild book is similar in format and is much like the other 1/2 of the Stock Record book. To show how similar these books are in format, this gallery is of the 1929 Guild book. This is the contents of the Index, readable online! Enjoy! !